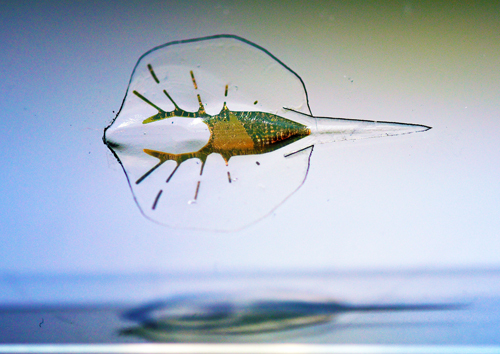 What do you get when you cross a robotic stingray with rat cells? A Harvard University researcher got what he hopes will help him build a human heart. Professor Kevin "Kit" Parker and his team drew on fish morphology, neuromuscular dynamics, and gait control to develop a living, biohybrid, stingray-shaped robot. They reverse-engineered stingray musculoskeletal structure using four-layered architecture, and cast the 3-D elastomer body in a titanium mold. To make the skeleton, they thermally evaporated gold, and produced a thin interstitial elastomer layer via spin-coating. Finally, they added a layer of aligned rat cardiomyocytes, which they anchored with a connective glycoprotein called fibronectin. They tissue-engineered muscles, and designed the ray's integrated sensory-motor system to mimic the undulating swimming movements of rays found in nature, and added photovoltaics so they could control those movements with light. According to a report in Science, their stingray swam faster and further than existing locomotive biohybrid robots, and maintained its speed for six days.